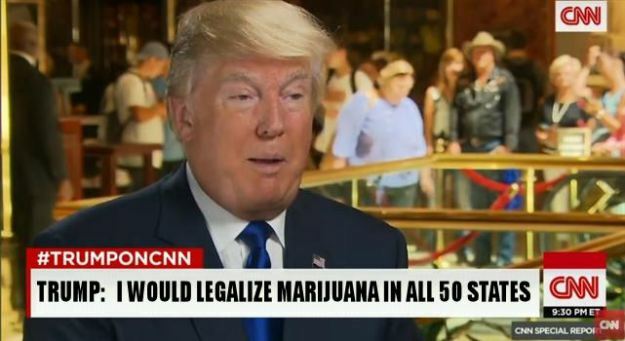 If you want the candidate with the highest probability of ensuring marijuana will be legal across the country, Donald Trump is your best option. In 1990, the Sarasota Herald-Tribune has Donald Trump on record claiming US drug enforcement is ‘a joke’ and all drugs should be legalized to ‘take the profit away from these drug czars.’ According to Trump, tax revenues from a legalized drug trade will be used to educate the public on the dangers of drugs. It’s no surprise that Trump’s isolationist tactics of building a wall that divides Mexico and the US along with banning all Muslims from entering the country has spilled over to international drug trade. While Trump may not be the most detailed oriented candidate, he redundantly insists that our jobs are being taken away by China and Mexico — including the esteemed title of ‘drug czar’. Trump also stated we’re losing badly the war on drugs, and you have to legalize drugs to win that war. For a candidate that bases his entire brand on ‘winning,’ losing a war on drugs would severely chip away from the superhuman aura he’s manifested since he announced his run for president on June 16, 2015. Presidential candidates tend to swing far right/left early on to appeal to their party’s core demographic in order to be their respective party’s nominee. Once the country is left with two candidates, both shift towards the middle to appeal to voters in the opposing field. That’s just the way the political game has been operating for as long as any CNN talking head can remember. Could Trump’s recent shift in his stance on marijuana be an objective attempt to garner key votes in his party? Of course it is. The real question is if elected, will Trump come through on the multitude of platforms he’s been promising the American people. That’s yet to be determined.